MIA but I am back! No, I am not in Miami. Although, it does sound like a good idea to go at the moment. My last post was exactly 2 months ago. Time sure flies by. I am still enjoying my summer vacation. However, first day back is the 27th. I can start setting up my classroom as early as the 20th. I plan to do that. It takes me about 2-3 days to get organized enough to teach for a few days. Then I work on my classroom throughout the year. So many things have happened since my last post. Let’s see. I went to Boston and Hartford. I had so much fun!! 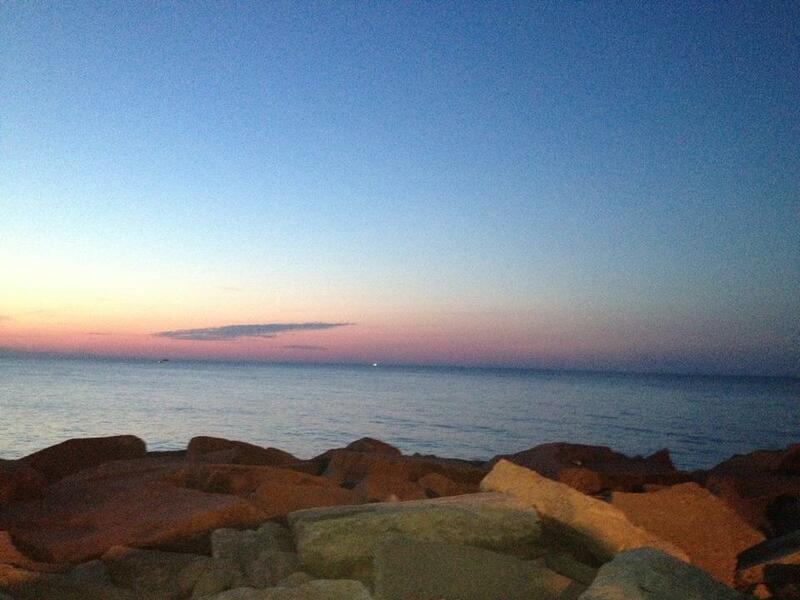 My favorite things were the whale watching and day trip to Salem. In Hartford I stayed with a friend a mine and together we went to a rose garden in Elizabeth Park. There was a wedding taking place and it just looked so beautiful! My nephew was in town from San Antonio so we went with another nephew many times to the movie theater. We also went to the beach, Six Flags Great America, and bowling. The boys loved it!! I love my two boys! He went back home on Thursday so it is a little quiet in the house. I live in an apartment with my sister that is owned by my younger sister. I have lived here for three years and have dealt with pure misery during the hot summer months. Two years ago I invested in several window units that helped a bit. However, this summer was just HORRIBLE!! Well, apparently my sister had applied to some city program that “gave” her new windows throughout the building AND central air!!!! Such a happy moment. We had workers in the building for two weeks. First, the new windows were installed. The window units were gone. Then the work began for the central air. They worked from about 7am-3pm. Furniture had to be moved and there was dust everywhere! I took this opportunity to go through my stuff to decide what to keep, throw away, or sell in a garage sale. Of course it was during these two weeks that temperatures were in the 100s so I was miserable here. I told myself that it would be worth it at the end. Sure enough when the workers were done it was pure joy and heaven to have cool air in the house. I bought two new pairs of gym shoes, Brooks Glycerin and Brooks Pure Connect. I LOVE, LOVE the Glycerin. So comfortable! My feet finally don’t hurt anymore after I run. As for the Pure Connect, I have yet to run in them because I was planning to use them for speed workouts and it so happens that I am taking a break from speed workouts. Why? Well, I have issues with my IT band, right hamstring, and weak gluteus maximus. It hurts to run fast. I can run but only for a short distance and slow. I took a two week break and then ran on the treadmill. My first run was 2.5 miles and then my second one was 3 miles. Felt good when I was done. I am going to physical therapy two times a week to deal with these issues. I decided not to run the Marine Corps Marathon in October. It was a combination of lack of motivation and injuries. I know, excuses, excuses. 🙁 Instead, I decided to focus on the smaller races, in particular half marathons. I am still on a mission to do a half in each state. I am on the road to recovery and am planning a few races before my bunion surgery in November. Well, that is the plan. I will know more once I go back to school and look into the required time off. My doctor told me a full recovery takes about 6-8 weeks. The longer I am off my feet, the better I will recover. I got into a car accident two week ago. Not my fault. I was rear ended. I am OK but have pain in neck and lower back. I am seeing a chiropractor for the pain. I have been rear ended so many times. I think at least 5 times with the car I have now (Honda CRV). I am convinced it is cursed and I need to get rid of it. My next car will be a Nissan Rogue. Well, that pretty much summarized my summer break. I am not doing everything I was planning to do but that is OK. I am still having fun. So how is your summer coming along? 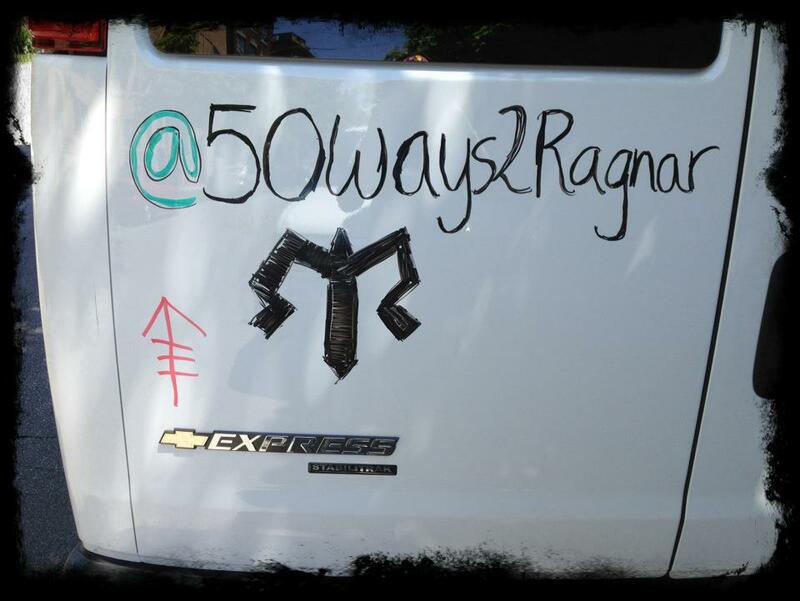 This past weekend I participated in my first Ragnar. 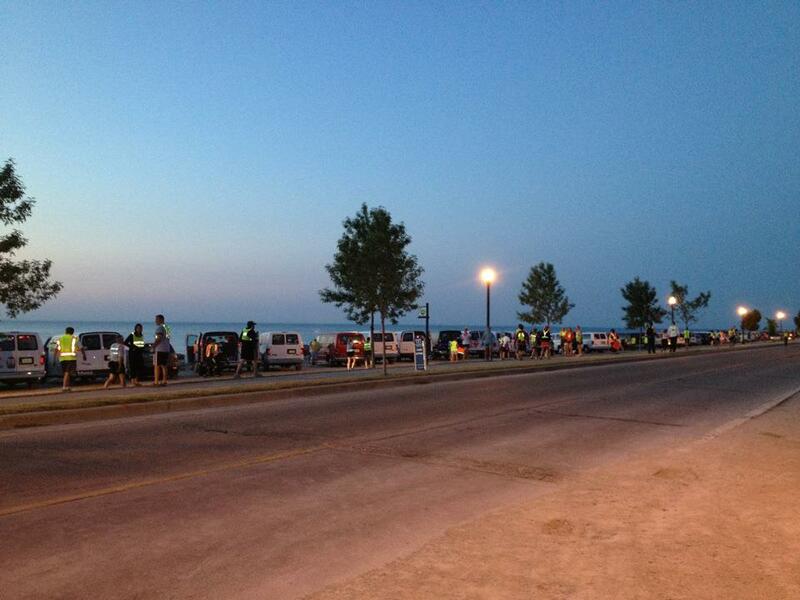 It is a race from Madison, WI to Chicago, IL for a total of 198.3 miles. Now, I didn’t run this by myself but instead with 11 other runners. Why did I want to do this? Well, I’ve done pretty much every kind of race that is out there from a 5K to an ultra marathon and I wanted to do something different. I did not know all of the team members. I did meet for lunch one of the captains and she gave me an idea of what to expect. There was another team meeting that I went and met 5 additional members. There was constant email communication prior to the race so I felt a little better before the race. The night before I gathered my stuff to pack. I had various lists to consult. One was provided by the captain and I also checked out Lazy Bones Running’s blog. Even with so much information I knew I was bound to forget something. Oh well. I hoped one of the other team members will have it. On Thursday morning I went over my stuff again and packed it in a hiking backpack. Whew! Heavy bag!! The team was scheduled to be on the road to Madison by 1:30 pm. Unfortunately, as we all waited to make sure we were all there, one of the vans was towed. I remember hearing that it was parked in an illegal spot thinking that it would only be for a few minutes. In fact it was only a few minutes and we were all shocked when we found out it was gone. While we waited to get the van back we decorated the other van. I know, one picture is simply not enough. Finally, the van arrived and off we went. It was a nice ride to Madison. I relaxed and talked to a few of the team members. I tried to take a nap but I couldn’t. We arrived at Madison at about 5:30 pm. We checked into the hotel and had plenty of time to unpack and unwind before dinner at 7 pm. For dinner we went to Monk’s Bar and Grill. I had a buffalo chicken sandwich with fries. It was delicious! After dinner it was back to the hotel. By then it was about 8:30 or so. I still had to get my stuff together for the next day. I was runner #6 and my first run (10.9 miles) was at about 10am. Since I was in Van #1 we were scheduled to start at 6am but check in at 5:30 so that meant being up at 4:30. Lights were off by 9:30. Van #1 left the hotel at 5am. Check in was a breeze. Perfect morning weather. However, we had been warned that it would be up to 100 degrees with the heat index. That freaked me out! I was ready runner-wise but anything could go wrong with the heat. 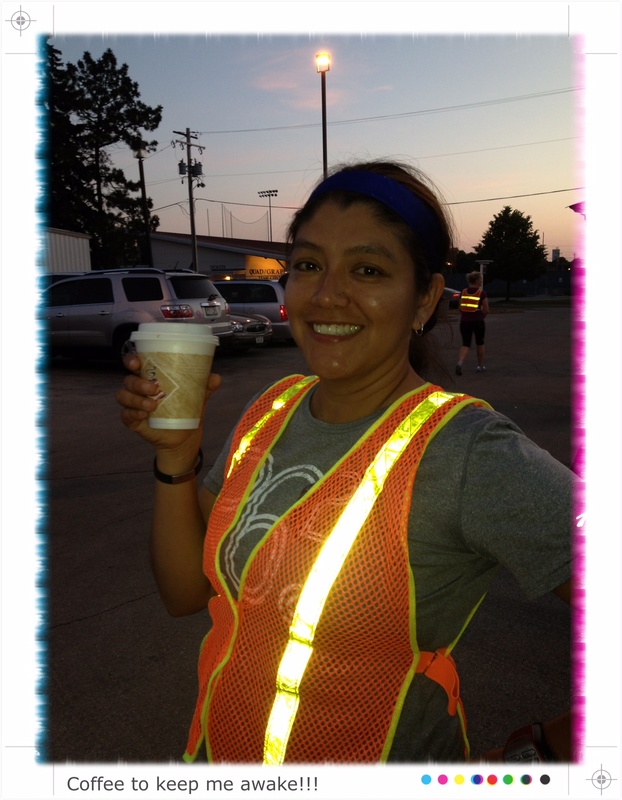 Our first runner took off at 6am for a 4.4 mile run. Dang, next time I want to be runner #1. It was fun driving to the various exchanges. It was also fun being there when the runners arrived and took off to the next exchange. Finally, my turn came. I was nervous because by then it was HOT. The path was mostly straight but lonely. There was also various up hills. 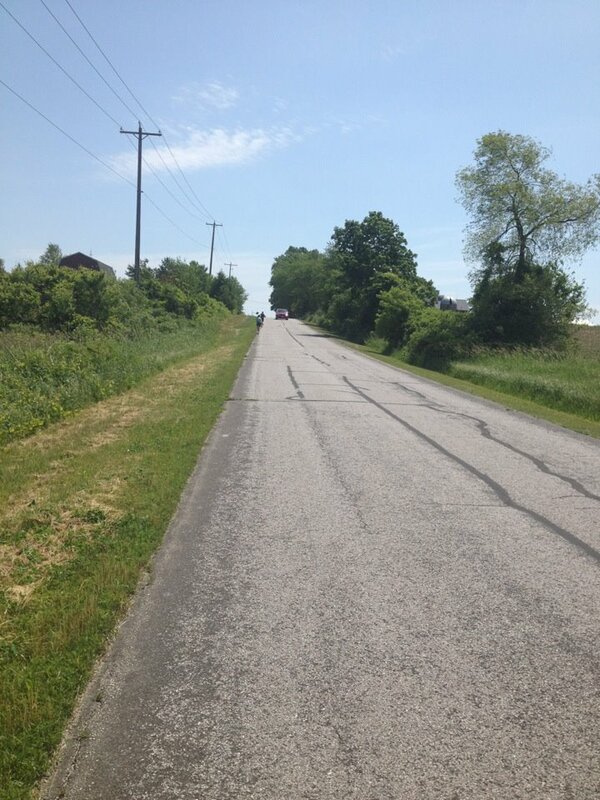 I was doing OK for the first few miles but then had to stop because it was so HOT!!! I carried my own water but that was gone. There was no water support like there usually is during a half or full marathon. I was annoyed. There were a few vans along the way that gave me water. My goal was to pass a girl that had been ahead of me since the beginning. It wasn’t because I really wanted to pass her up but it was more of a motivation for me. As you can see, it isn’t like a regular race where there are runners left and right. Finally, I saw that magical “One Mile To Go” sign. Time to let my team members know I was almost done. There I am!!! Yes, I am happy to be done!!! Can you tell? Van #1 was done for the moment. It was about 12:30 and we were all tired, hot, and hungry. We went to get something to eat. I had a grilled cheese sandwich that came with crackers. Seriously? No french fries? I also drank a big glass of chocolate milk. It was delicious and hit the spot. We had about 5 hours to “kill” before it was our turn to run again. We went to Sports Authority because one of the girls had chafed and needed another pair of shorts. We also bought more ice and water. Off we went to the next exchange. There were so many people there. I took out my yoga mat and blanket and found a spot to rest and take a nap. However, I was too tired and hot to sleep. It just felt good not to be sitting in the van. Besides, I was still hungry. I was not going to run till close to midnight so I knew I had to eat something else. Luckily, the Girls Scout were there selling burgers. I bought one and eat it in probably two bites. It was pretty neat to be at the exchange area. There were many other vans and it was cool to see how they were decorated. 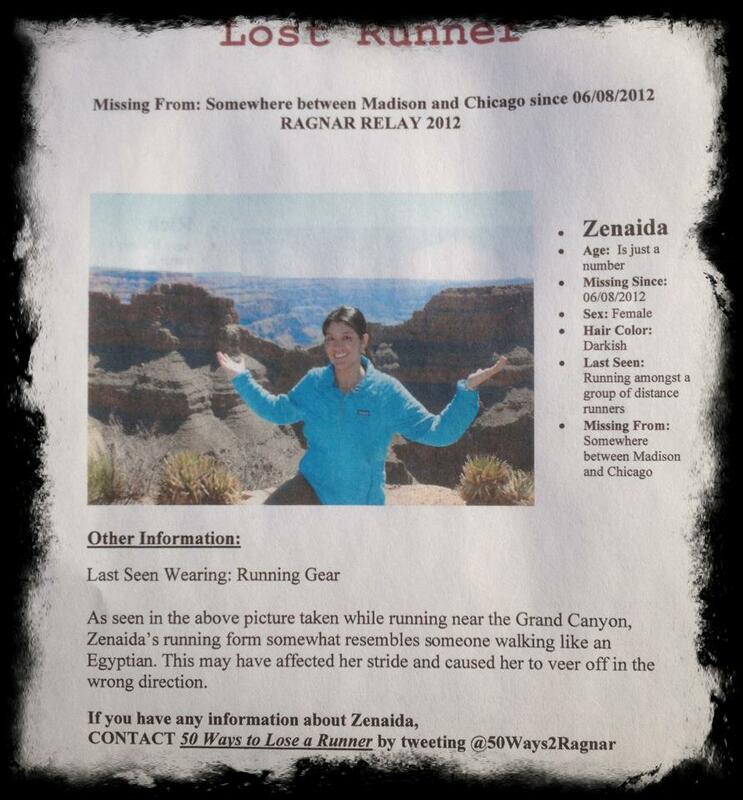 Also, it was during this time that one of the team members put up lost posters outside the van. I think mine is pretty cool. My second run was much better. It was only 3 miles but in the dark. It was my first time running in the dark. I had a reflective vest, a head lamp, and a light blinking in my back. No way anyone would not see me. When I was done I received my prize from Pacifico for running the longest leg. Anxious to know what it was? A pair of sunglasses. Yep, a pair of bright yellow sunglasses. I got over my slight disappointment. Now it was time to shower and sleep. At about 5:30 we arrived at the next exchange just in time for a beautiful sunrise. Not much later runner #1 took off again for her last run. It was hot again. Luckily my last run was 5.8 miles. By the time my turn came it was hot and sunny again. Ugh! No backing out. I could do it. While waiting for my turn we used the bathroom at the YMCA. I did not want to use another port-a-potty. There are more people at my exchanges (this is when both vans had to be together) and the potties were getting kind of smelly. Time to run again. The course took me through a bike path and then through Waukegan and North Chicago. Definitely not pretty areas. Oh well. I ran but made a few stops along the way. I was so happy when I was finally done. Now it was Van #2’s turn to run. We went to eat (I had a delicious cheeseburger with fries) and then off we went to Chicago. I slept along the way. I had not had a good night sleep since Thursday night. We arrived at one of the team members’ house and we unloaded and cleaned the van. Then she was nice enough to let us shower. I felt much better afterwards. We hung around for a little bit till about 3 or so and then went to Montrose Harbor to reunite with the rest of the members. Our last runner was still on the path and our plan was to meet up with him and cross the finish line together. When we finally saw him we were screaming and yelling. It was so good to see him!! What a great feeling to cross the finish line. We took a group picture together then enjoyed our free beer and pizza!!! I had a great time during the relay. It was tiring but so worth it. I might do another one next year but at least now I know what to expect. By the way, I overpacked. I did have pretty much everything I needed and more. Next time I will take a smaller backpack. 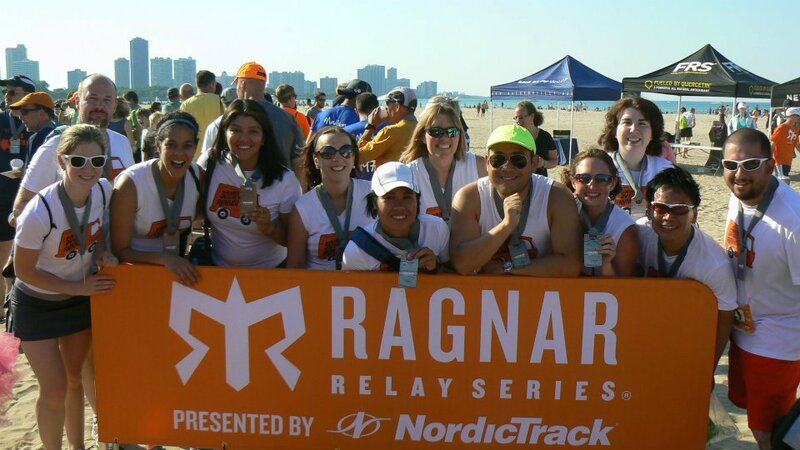 I encourage you to do a Ragnar Relay. You’ll meet so many great people and it will be a wonderful experience!!! 1. Finally done with school. Time to travel, run, and have fun. Enough said. 2. 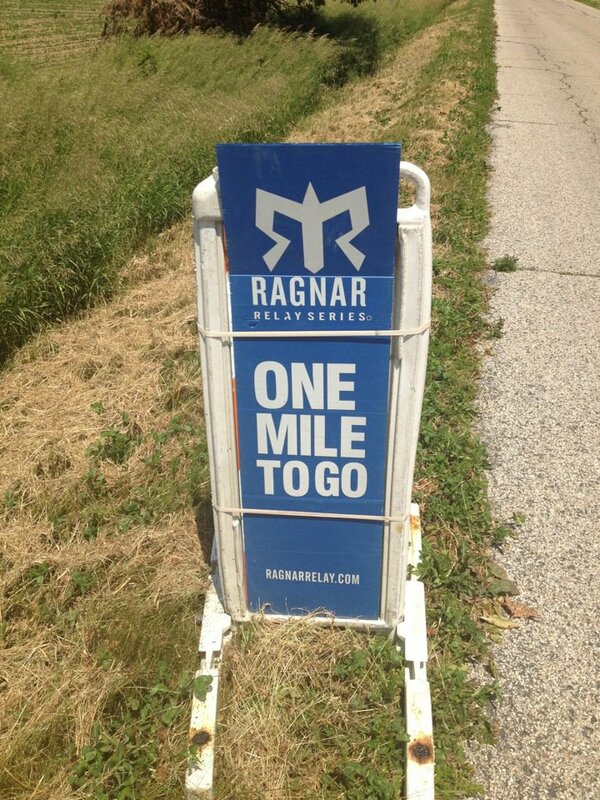 I am leaving this afternoon to Madison, WI for the Ragnar Relay. When I joined the team I was Runner #2. I was responsible for running the following: 4.5 (Moderate); 4.4 (Moderate); and 6.2 (Hard). Not bad right? 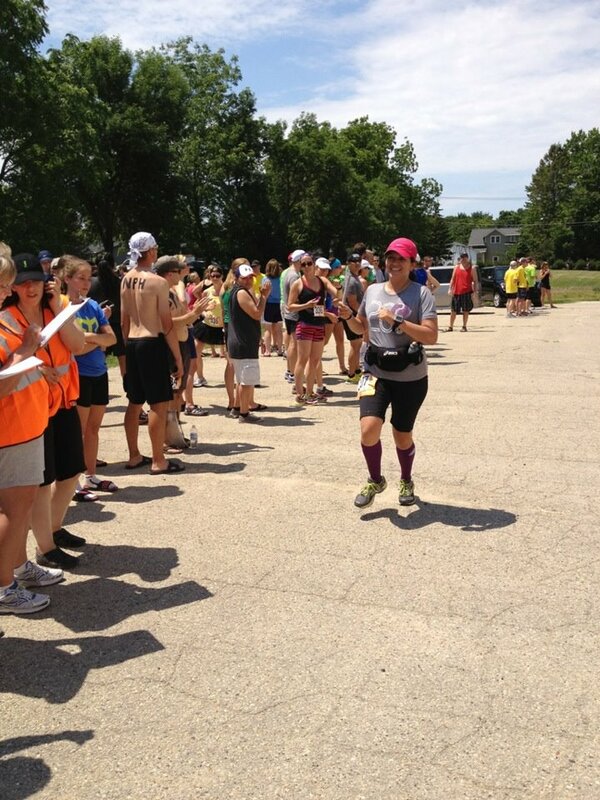 Well, I found out Sunday that now I am Runner #6 and have to run, ready….10.9 (Very Hard); 3 (Easy); and 5.8 (Hard). Gulp! I don’t mind too much running 11 miles but very hard? I really, really hope they’re not very hard at all. 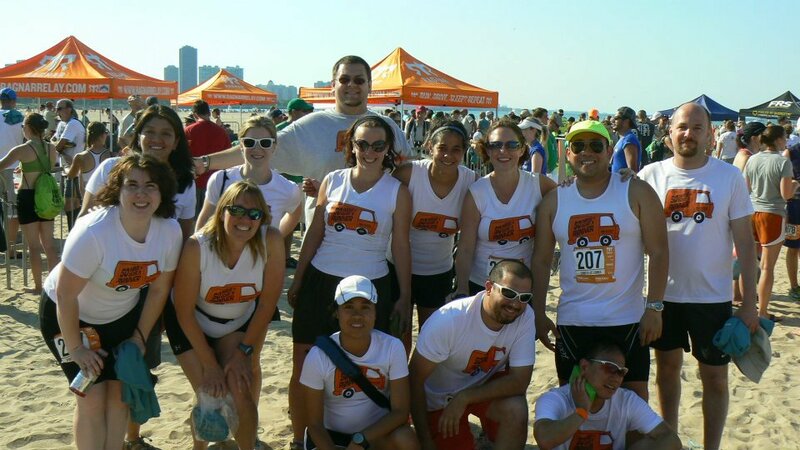 On a good note, I found out that “Runners who run leg 6 at the Ragnar Chicago have something extra to be excited about – besides conquering the longest leg on the course. Be prepared to receive a special gift from Pacifico as you finish Leg 6!” Free beer for a year? I hope so!! 3. I am debating whether to run the Women’s Half Marathon in Minnesota on August 26, the Philadelphia Half Marathon on November 18, or The Space Coast Half Marathon in Florida on November 25. Decisions, decisions. Have you done any of these races? What did you think? I am a little late with this post. Blame it on “feeling blah” and “ready to end this school year” attitude. This month I ran 81.4 miles compared to 35.3 last month. Total this year is 421.18 miles. I ran four races in May: Run to Remember 5K, First Midwest Bank Southwest Half Marathon, Y-Me Race at Your Pace, and Fleet Feet Sports Soldier Field 10 Mile. I did not finish the Chicago Spring Half Marathon. I did all of these races last year and managed to not only PR on the 10 mile race but also to improve my finish time from last year on 3 out of 4 races. Yay me!!! Upcoming races this month include. I will also be doing a duathlon on the 24th. I’ve never done a duathlon and am super excited about it. First, I will run 2 miles, a friend will bike 11 miles, and then I will run 2 more miles. I don’t own a bike and have not been on one in years. Well, except for an 18 mile ride last year in Ecuador in which I fell and told myself I would never get on a bike again. Maybe next year I can do both portions. I don’t have a time goal for the duathlon except for us to finish it. I can’t imagine why we wouldn’t but you just never know. 1. I have 7 days left of school (last day is Tuesday, June 5). Well, maybe 6 since we are going to the Museum of Science and Industry the day before our last day. I am so excited! This has been my most difficult year with my students. I’ve had so many problems with them. I am hoping that next year is better. 2. 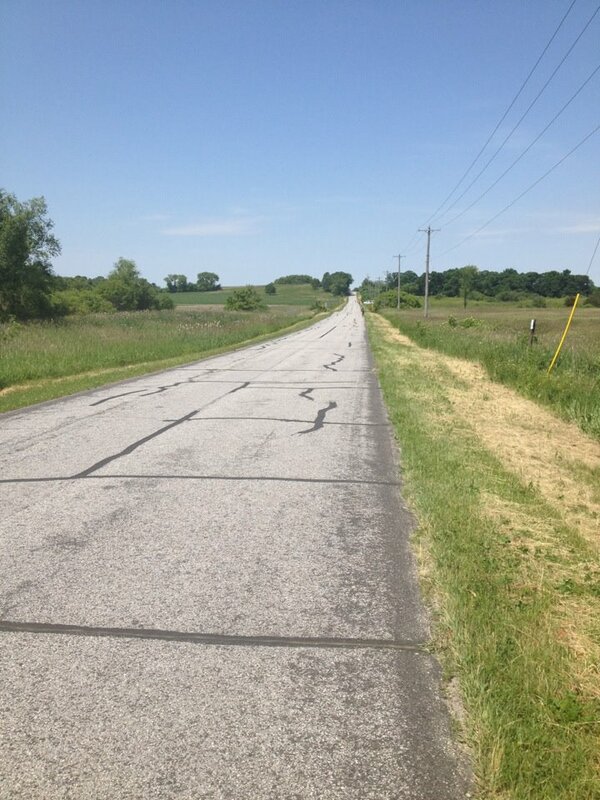 Once school is done I will be doing a Ragnar Relay from Wisconsin to Chicago. I am excited and nervous too. This will be the first one I do and have no idea what to expect. I’ve met with one of the team’s captains and she explained a few things for me. There is another meeting in June to meet the rest of the team and discuss final details. I need to review my packing list and make sure I have everything.